The first few carriages of the train are GWR, so I would guess the Shrewsbury � Hereford line. The hedge looks similar in both photos confirming that the locations are close to each other. The PW doesn't look like LNWR practice. 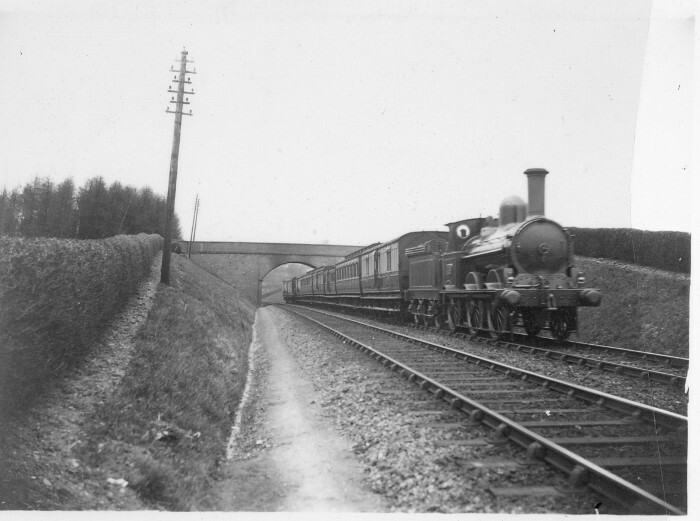 These photographs were published in the LNWR Society Journal Volume 5 Number 3 (December 2006) when Ted Talbot stated that the location of one of them was Elmhurst Crossing, north of Lichfield. If this is so it is remarkable as GWR stock was rarely encountered on the Trent Valley Line. Looking at the hedge I am convinced that the two photos were taken from locations close together. It would seem that, as this appears to be the same train on different days, the working was a regular one and not a special or an excursion. Now another mystery is, why would Mr Wilkinson seemingly make a deliberate effort to photograph these two rather ordinary trains when he could have photographed prestigious LNWR expresses? Was he aware that the sight of GWR stock was very unusual? If so, how did he know that the trains were running so that he could position his (cumbersome) photographic equipment? Although much will have changed in 115 years, looking at Google, although the suggested location near the former Elmhurst Crossing cannot be confirmed, it is not disproved either. The field by the lineside still exists. The roadbridge would be what later became the A51. I wonder if the mystery location is the over bridge at Battlefield north of Shrewsbury. At that point the line comes through the bridge in the cutting and on to an embankment dropping down into Shrewsbury. The attached picture (click on either of images above to see this photo) captured on my phone shows the location. It's on a private access road so not the best place for photography. I understand that Mr Wilkinson may have lived in Shropshire at some point although he worked in Birmingham in the family business.